Visiting a historical place is really exciting and interesting as well. Fortunately last month I got a golden chance to visit such a historical place. The place has an enriched historical background. It was the Shat Gombuj Mosque at Bagerhat. It swathe eve of the last winter. My maternal uncle who is police officer came to our house with his newly married wife. 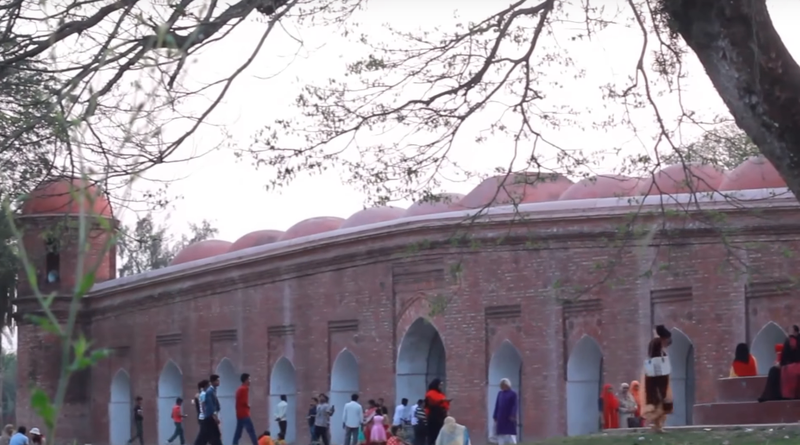 As our house is Jessore, his wife told my mother to visit the Shat Gombuj Mosque as a group tour. Two of my younger sisters instantly insisted my uncle on visiting the place. My uncle promised to arrange everything regarding this. So we decided to go there the next morning as our school was closed. My Uncle hired a microbus that night for our journey. My mother prepared many delicious dishes to take with. The next morning the hired microbus arrived at our home in time. Being ready we were waiting for the car. So we set out for Bagerhat at 8 am. The journey had a festive mood for us. Mazer of Khan Janan Ali There we found many other people visiting the Mazer. Some followers of Khan Janan Ali were also seen there. Then we went to the large lake near the mosque. There we found the crystal water and numerous waterlilies. The best attraction there were the two crocodiles named Kalaparhat and Dhalapahat.They were said to be a legendary companion of Khan Janan Ali. We stayed there for some time and ate some home-made food takes from our house. Then we left for home with an evergreen memory of visiting such a historical place. The journey, the visit, the experience everything regarding the event is still vivid in my heart. The visit is both interesting and informative for me as well as all my family members.